Spa Vapor+™ Essential Oil Vaporizer + FREE 10 ml Olbas Oil - a $9.50 Value! - Penn Herb Co. Ltd.
Spa Vapor+™ Essential Oil Vaporizer + FREE 10 ml Olbas Oil - a $9.50 Value! Create a relaxing, refreshing or purifying atmosphere with the Spa Vapor+™ Ultrasonic Essential Oil Diffuser. 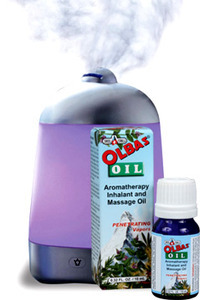 Simply add a few drops of Olbas Oil in some water, and your aromatherapy session begins! The quiet ultrasonic action instantly vaporizes the pure essential oils into the air for a truly healthful experience in minutes. Use Spa Vapor+™ Diffuser anywhere: bedroom, office, living room, exercise area. Diffuses ultra fine vapors without heat, keeping the holistic properties of the oil intact. Features 6 rotating color LED lights that can be turned on or off. Runs up to 4 hours, automatic shut off, no batteries required. Includes plug-in 24V low voltage adapter and cleaning brush. Color White/Grey body with an attractive silver cover and base. Size 4" x 4" x 6", BPA Free. Uses high frequency ultrasonic technology that vibrates cool water inside the unit creating an ultra fine mist. When essential oils are added, they are immediately dispersed into the air, providing immediate benefits while helping to ionize the air. 1. Fill the base with luke warm (not cold, distilled or purified/filtered water) to about 1/3 full. DO NOT OVERFILL. 2. Add about 5 or 6 drops of essential oils directly into the water. 3. Misting takes up to 10 minutes to reach full output. 4. Cleaning: rinse water tank and wipe it dry with clean cloth every time you use a different type of oil. Additional cleaning and maintenance directions included in package.